The intimate connection between the Rider's hands are with the Hand Grip, Brake Levers and Shifters. While Hand Grips are pretty much universal between bikes & trikes, Brake Levers and Shifters were designed to be installed on the opposite end then where just about every trike OEM mounts them. 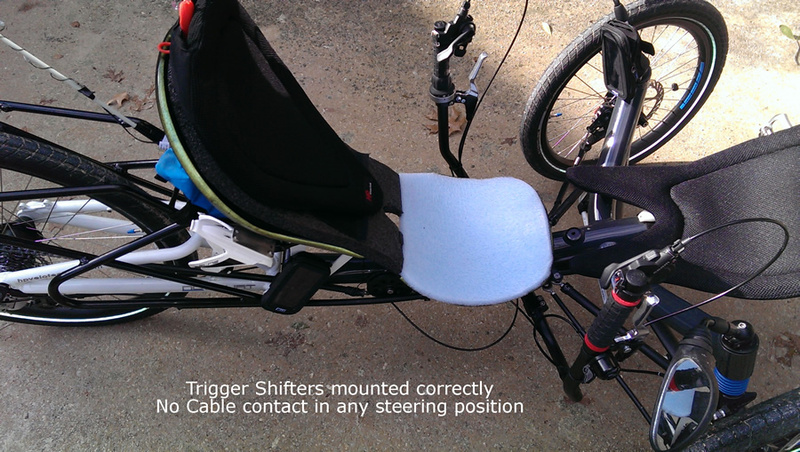 Effectively trikes may have the controls mounted UPSIDE DOWN! Hand and finger sizes like the rest of the anatomy can differ in size. Larger hands will better fit fatter grips while smaller hands fit smaller grips. While that makes perfect sense, probably 98% of all the trikers out there have the same grips the OEM installed. An undersized grip will stress the fingers a bit more while restrict the blood flow. Cold weather riders with bigger hands don't seem to understand why their hands get so cold despite wearing thick gloves. If that describes you, try a larger diameter grip. An oversized grip will have the Rider stressing their fingertips and barely able to grip the brakes. Find the thinnest grip you can for petite hands. Everyone sells grips, even some decent Schwinn grips are available at most Walmarts. If needed, slice the endcap off with a razor blade. Grips tend to stick to the handlebar tube. Take a small screwdriver and lightly force it between the grip & the bar, then walk it around to streatch the grip and loosen its "grip" on the bar. If you've got some ethanol pour a little bit in the gap around the screwdriver to lubricate the rubber grip. DO NOT USE OIL. Also use some ethanol to lubricate the grip during replacement. It evaporates pretty quickly. It just seems too simple and inexpensive of a task to ride with an ill-fitting grip, don't you agree? The intent here is to discuss Brake Levers in the context of fitting the Rider however to do so we need to breifly discuss Brakes. Much more detail on Brakes is found in the Drivetrain/Brakes topic. Most Brake systems are mechanical with cable actuation, while others are hydraulic actuated. Mechanical systems are much more foregiving on cable routing while hydraulics have to be more careful with how tightly the hose is bent so it doesn't kink. Its not enough to set the position and be done with it, you have to look at the entire route of the cable or hose and turn it in both directions to be sure its not going to kink, or move in a way that it could kink later on. In summary, don't let the cables/hoses kink! Mechanical Levers may come in high leverage and low leverage. High leverage means the lever has more leverage; which is to say the lever will move further and take less force for braking. Low leverage will take more force with less distance. Some models of either mechanical or hydraulic have threshold adjustments. Threshold adjustments control how far the Rider has to reach to grab the Brake Lever. Threshold settings are shown in the green circles to the right; a lot of folks that already have them don't realize they do. This is a really great feature for riders with smaller hands/fingers as they don't have to reach as far. Often these fully adjustable Brake Levers are like a fine dessert to those who struggle for the bigger levers. Adding to the small finger challenge is a comment from above; Brake Levers are monuted upside-down. However thats actually a good thing because the profile of the lever is actually better for the bottom finger lengths. One of the other key differences is the hydraulic has a master cylinder resevoir. With hands on the grips in a dead ahead position, the Rider should be able to reach the brake lever with their pinkies and squeeze without moving their hand as if in a panic stop situation. This is essential if they ever ride in any traffic at all. Position is easy to find, but if they can't reach this way they need Brake Levers with Threshold Screws. 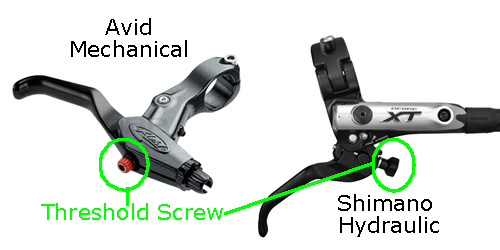 As on the subject of Brake Levers more detals are covered in the Drivetrain Chapter. Most people prefer the Bar End Shifter as its the only one that most OEM's mount as they were intended. When the Twisties are mounted upside down a term found only in Trikerville is "Pinky Shifting" and its as awkward as it sounds. Maybe worse. "They've always done it that way"
Not sure about anyone else, but when I have a control on a vehicle I like it to be used as designed as a minimum. To that end we tried mounting a set of Twisties in the manner they were designed for. Suddenly I lost my preference for Bar End Shifters. Later we tried a set of Trigger Shifters. Knocked Bar Ends out of the Park. 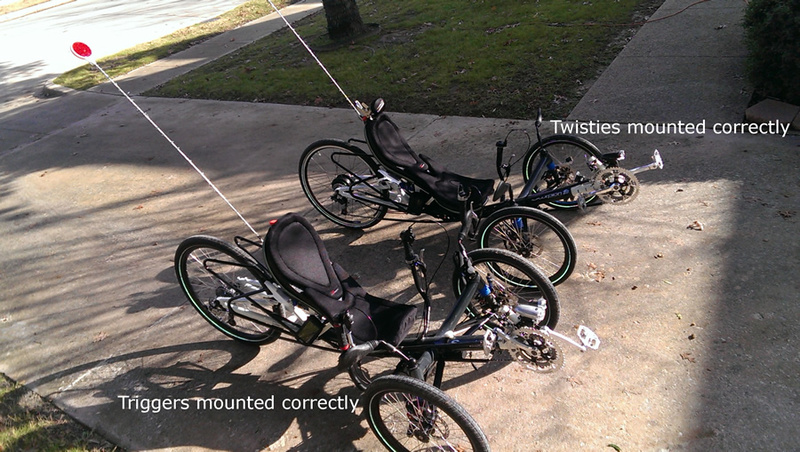 So what happens when you mount Twisties or Triggers correctly? You need about 18" extra length of cable, a few more cable ties, and about 5 minutes longer in routing cables. You will lose about an inch of hieght from the top of the Hand Grip.